The earliest radiation therapy machines used radioactive sources such as cobalt to produce the ionizing radiation needed to treat cancer patients. Some machines still use an active radiation source, but most radiation therapy today is accomplished with a linear accelerator. In principle, a linear accelerator works just like a computer monitor you are using to read this article. The electrons are accelerated by the gun in the back of the monitor and directed at the inside of the screen, where phosphors absorb the electrons and produce light. However, a medical linear accelerator produces a beam of electrons about 1,000 times more powerful than the standard computer monitor. The longer a linear accelerator is, the higher the energy of the beam it is able to generate. Patients can be treated directly with this resulting electron beam, as long as the beam is spread out by scanning magnets in order to create a safe level of radiation. The medical linear accelerator spreads and directs the beam at the selected treatment area on the patient’s body. A challenge with the electron beam is that it spreads quickly in tissue and cannot access deeper tissue for treatment. To solve this problem, many linear accelerator machines were designed with the option to switch to a mode in which x-ray photons are used for treatment. These can penetrate much more deeply, without harming surrounding tissue. To carry out this sensitive task, the electron beam is greatly increased in intensity and a metal foil followed by a beam flattener is placed in the path of the electron beam, which transforms the electron beam into an x-ray. Many hospitals throughout the world are now using linear accelerators to benefit their patients by more effectively targeting the tumor area while reducing the most common side effects experienced by patients who are receiving radiation treatments. Some of the newest linear accelerators feature Intensity Modulated Radiation Therapy, a pioneering development that uses dynamic multi-leaf collimation to modulate the intensity of the radiation beam. This allows physicians to spare healthy structures adjacent to the diseased areas, therefore focusing the radiation on the tumor alone and producing fewer side effects. It is customary to find standard linear accelerators in radiation therapy facilities or cancer centers that offer radiation therapy treatment. These linear accelerators, which weigh between 5 10 tons, are fixed permanently to the floor of a well-shielded treatment room. There are also mobile linear accelerator models, consisting of three components: an accelerator mounted on a motor-driven gantry, a modulator and a control console. 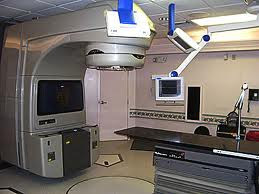 Even though the mobile linear accelerator is relatively lightweight in comparison with standard linear accelerators, they weigh about 2,500 lbs and require about 15 minutes to move into the operation room.